Joel Allison didn’t just want a career. He wanted a calling. Born in rural Missouri, he spent part of his childhood in a small four-room house with no indoor plumbing. He woke up early to milk the cows, gather eggs and feed the pigs before school. As a youngster, he forged a work ethic and sense of discipline that guided him throughout his career. Allison majored in religion and journalism at Baylor University, an education financed by a football scholarship, with a vague sense of pursuing some kind of ministry. He was about to graduate in 1970 when he shadowed his brother-in-law, a Fort Worth physician, for a photojournalism project. While the pair was touring a hospital in rural Uvalde, the facility’s chief executive officer mentioned that he had planned to enter the ministry but decided to attend graduate school to become a hospital administrator instead. The CEO’s comment was an epiphany for young Allison. He would pursue a Christian ministry of healing. After earning a master’s degree in health administration from Trinity University in San Antonio in 1973, Allison spent most of the next two decades in executive hospital positions in St. Joseph, Mo. ; Abilene; Amarillo and Corpus Christi. In Abilene, he rose to chief operating officer under Boone Powell Jr., who later became CEO of Baylor Health Care System. During Powell’s 20-year tenure as CEO that ended with Allison’s ascension as his successor, Baylor would acquire seven hospitals, create affiliations with several others and form HealthTexas Provider Network (HTPN). He challenged the organization to transform itself from a collection of hospitals to a seamless integrated delivery system in three years. Powell recruited Allison in 1993 to oversee the transformation. Under Allison’s leadership, Baylor merged with Scott & White Health and became the largest not-for-profit health system in Texas. The system serves a population larger than the state of Georgia. Baylor Scott & White now includes 48 hospitals, more than 1,000 access points, 5,500 active physicians, and 44,000 employees. Allison has been ranked by Modern Healthcare as one of the “Most Influential People in Healthcare” alongside national healthcare thought leaders and policymakers such as members of Congress and the U.S. president. In addition, he was D Magazine’s 2014 “D CEO of the Year” — the first health care CEO and the first CEO of a not-for-profit to ever achieve this high honor. 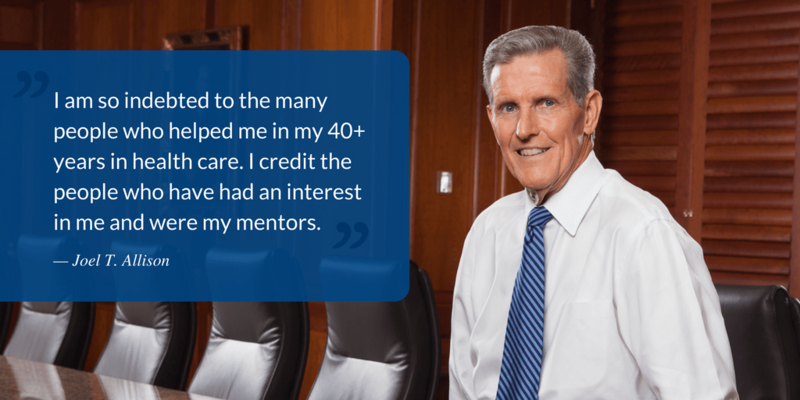 While Allison excelled on the business side of healthcare administration, one of his signature accomplishments was philanthropic, exemplifying his vision of health care as a ministry. After a 2010 earthquake in Haiti, Allison created Faith in Action Initiatives (FIAI), which has spread the system’s ministry of healing to those in need at home and overseas. FIAI sends relief supplies, equipment and resources to areas affected by natural disasters in the U.S. and worldwide. FIAI has impacted communities in dozens of countries through medical missions and millions of dollars in disaster relief, as well as sponsorship of hundreds of Baylor and Baylor Scott & White clinical professionals to travel on mission trips. FIAI also serves and supplies scores of local free access clinics and ministries. The funding of this effort now carries his name as the Joel T. Allison Faith in Action Initiatives Fund. 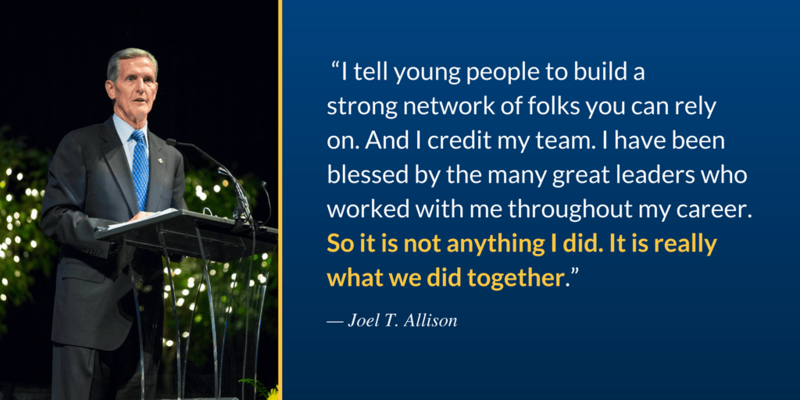 Allison is quick to credit others for his success and credits many mentors in his life: Powell, a sixth-grade teacher, his high school football coach and his pastor. Allison constantly preached about the system’s four non-negotiable principles. Put the patient first in everything that you do. And do the right thing for the right reason. Allison’s health care career became his mission and ministry, and, even on his final day as president and CEO today, he awoke with the same passion he always has to work hard for the people of Baylor Scott & White Health and the communities we serve. “I’ve never worked a day in my life because I love what I do.” Allison said.